Today’s Front Page: New Blog Design and a Fresh Freebie. Enjoy! New TemplateMonster design, and a revamped blog – previous week was full of great news, and all of us (Monster’s team) were very excited about that. We’ve been working on it for over a year or so, trying to deliver you much more convenient, user-friendly design that keeps pace with the latest technologies, and now we are glad to show you the results. “Sharpen your web design thinking” – this is the greeting message of the polished TemplateMonster blog that welcomes both beginners & experts to enjoy a good read on web design. We hope that you will like the new looks of our resources and will enjoy them greatly. By the way, there is one more thing we’d like to talk about today. 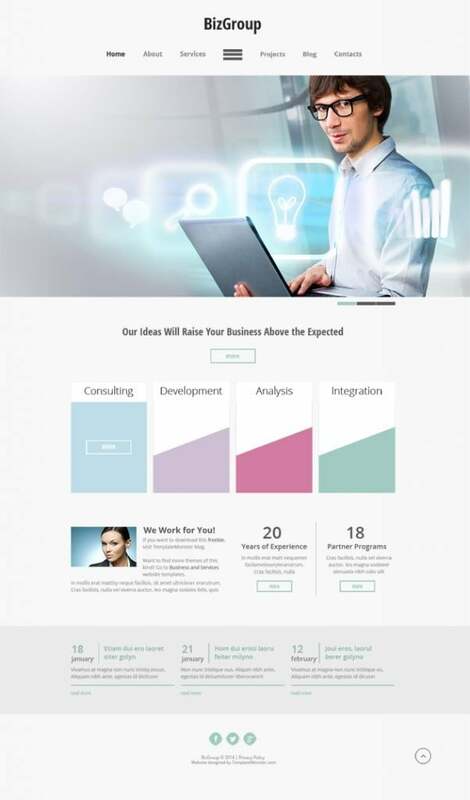 It’s the freshly released Free HTML5 Theme for Business Site. Using this freebie, you’re free to look in any desired business direction: business, consulting, communications, internet, science, etc. Just add minor changes into .psd files, and get what you need. Contemporary look and uncluttered layout lit up this design. Emphasis on visuals, clever presentation of information and usability – this is what this theme is all about. This extremely clean layout will work great for communicating business ideas. Border menu. For the ease of use and clean header, this design makes use of animated border menu. Clicking the dashes inside, you activate the menu and can reveal all its items. Featured boxes enrapture with shape hover effect. Notice that cool effect when the hidden information with “more” button is revealed. List with flip effect. Enjoy the hit of the freebie that is implemented on Services page. This effect helps take the most of the page space, arranging all information in well-structured manner. That's all you need to know about this theme, now check out its live demo to see it in action. I wish you great inspiration and WOW designs. See you soon!